When spring and summer come around, tree owners need to have maintenance done on their trees to ensure new growth and prevent any damage to the home or backyard. While some are willing to take on the responsibility themselves, it’s sometimes easier and safer to hire professional services to do the job, especially when it might mean felling a tree and removing stumps. It is absolutely vital that tree felling is planned very carefully and is undertaken only by qualified professionals using the correct working techniques, the best possible safety equipment and a modern chainsaw with functioning safety features. Trees must be felled safely and in the direction that you want them to fall. The factors that first and foremost affects tree felling is whether there are major obstacles in the area (overhead lines, roads and buildings, etc.) and whether the area is accessible to the public. Nature conservation is also an integral part of the work we carry out and our felling plans take into consideration the plants and animals that live in the vicinity of the tree(s) to be felled. 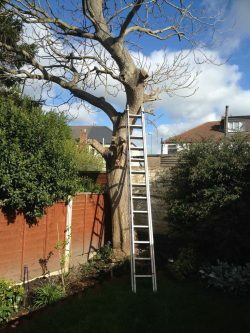 So with this in mind from the smallest shrub to the largest tree in an awkward place we will endeavour to carry out a professional job and remove whatever is required with the minimal of upheaval to the client and surrounding area. Furthermore all tree waste is then cleared and taken away for recycling leaving the site in a clean and safe condition. Please feel free to contact us with a view to arranging a site visit to discuss your requirements and provide a no obligation quotation. Does it lean in one direction or another? Is there a clear area where it can safely fall? Are branches from a nearby tree in the way?